No matter how many times we’ve seen the clip, it’s impossible not to cheer at India’s 2011 World Cup Win, or choke up while watching Sachin deliver that heartfelt retirement speech at Wankhede. Sure there’s a lot more this film could’ve been, but it coasts along on the strength of nostalgia, familiarity, and our collective love for a man who’s name we turned into a chant. I’m going with three out of five. Prepare for major gooseflesh. OneWordReview… SachinABillionDreams: Superb A journey worth experiencing… Entertains. Enthralls. Enlightens. More than a definitive docu-drama, the film is a celebration of the master blaster’s really long career, his humility and rooted approach to life.I wiped my eyes when the same footage played inside the theatre, I won’t deny that, but that’s mostly because of the nostalgia attached to my teens. It’s reliving the Sachin magic, not a perfect docu-drama on him. Still enough to bring you to the theatres. We have been doing it for years. Maybe one more time. Sachin: A Billion Dreams is thankfully not a biopic. This is a documentary not merely about the man with that name, but one narrated by him, one where he tells his own story in his own words. It is not journalistic or incisive or probing. It feels, instead, intimate – as intimate as it can feel, anyway, for a film where an audience claps and cheers alongside those who clapped and cheered live, years ago. Which is to say: it is us today applauding in time with us yesterday. 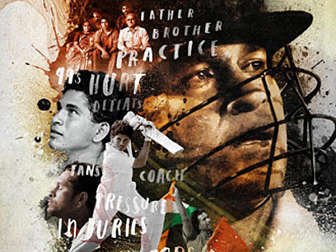 Sachin Tendulkar’s journey in this film looks so real that you even have moments like ‘Aila, Sachin bhi aise karta hai.’ It not only celebrates the personality that he is but also Indian Cricket in all its glory.What’s Bad: Strangely, the film may not come across as a uninteresting affair for those who are not Cricket fans but their idea of it being a feature film certainly doesn’t come true here. The docu-drama with Sachin himself narrating may not appeal to everyone.! If you’re of the generation that grew on Bhajji’s off spins, Sachin’s masterstrokes, Ganguly’s aggression and Dravid’s ‘Mr. Wall’ days, this will bring you back to Cricket once more. And not to mention, ‘Sachin… Sachin… Sachin… ’ never dies. Because Sachin isn’t a name. It is an emotion. What makes the movie endearing is a peek into his private life like his love story, footage from his wedding, the birth of his two children and the special bond he shares with his father. The footage might be blurry at times, but you don’t mind as it engrosses you. He might not be an actor but engages you with his story-telling and it’s impossible to be unmoved with his disappointments and achievements. You will be overwhelmed with emotions when you see the clip of him giving the retirement speech in 2013. Sachin: A Billion Dreams will make you feel patriotic in places and it is one of those films that make you leave the theaters with a smile. So, do yourself a favour and watch the movie this weekend. We promise you – your 2 hours, 20 minutes will be totally worth it. Sachin: A Billion Dreams” is an Indian biographical film based on the life of Indian cricket icon and living legend Sachin Tendulkar. A tale of a restless 10-year-old boy and his journey from watching India’s first World Cup winning skipper Kapil Dev lift the trophy, to the fulfillment of his dream of holding it in his hands for India. He is the most celebrated sportsperson in India, a virtuous hero who created an era, which Indians are proud of. The film captures Tendulkar’s dedication to cricket and his personal life in dramatic detail, as well as reveals aspects of his life which have never been heard or seen before.